Momoko announces that the 6th of September is ‘Younger sister day’. Airi asks for clarification, and Momoko explains that it’s the eve of the midpoint of the astrological sign Virgo, the maiden. The girls agree that it’s a complicated definition, and Airi tries to work it out – ‘so tomorrow it’ll be the day that Virgo is at its midpoint?’ and Momoko responds in the affirmative. Airi ponders about the younger sister = maiden relationship, and then mentions that she’d like to set up an ‘Older sister day’. Momoko suspects that one already exists. Airi then points out that all the Buono! members are older sisters. Elder sisters to a younger brother, in fact. Momoko asks if they’d ever thought it would be nice to have younger sisters, and the others both admit that they’d thought about it before. Miyabi says that it’s something she’s been thinking about recently, while Airi mentions that she occasionally thinks about how nice it would be to have a female sibling, and be able to wear matching outfits. Momoko agrees that you can’t really share things with a brother. Momoko also admits that she’d like a younger sister – one who could stand in class and boast about her amazing sister. Airi wonders where that statement came from, and Momoko explains that her younger brother speaks ill about her. Their relationship is good, but how he acts at home is completely different from how he acts outside. She recounts a tale of when they were at the supermarket recently and he called her to come over quickly, she replied with a popular quote from the movie Frozen, ‘I got it~’. This resulted in her getting a complete scolding from him because he was embarrassed. The sternness of her brother surprised the others. Momoko: My brother does it every time, and being told off like that makes this older sister kind of sad. 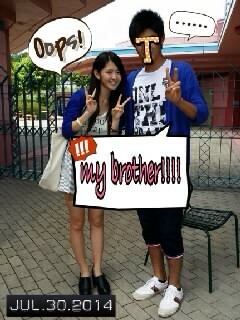 Airi starts talking about the time when she went to an amusement park with her brother in matching outfits. This really shocks the other two and they start squealing, with Momoko stating that it’d look like they were going out. Airi explains that it was actually a coincidence, that when they left their rooms, ready to head to the amusement park, they were both wearing white T-shirts and blue cardigans, she was in shorts while her brother was in jeans. Colour-wise, they were completely the same. Miyabi asks why she didn’t change, and Airi replies that it seemed funny, like they were pulling off a joke. They praise Airi’s relationship with her brother. Momoko sums up stating that younger brothers are good, but that they’d like to have younger sisters as well. Discussion topic: If the three of you were to go on a day trip, where would you go? The girls start off by agreeing that a day trip sounds like a great plan, and how they’d like to go on one. Airi suggests that they might even go overseas to parts of Asia, like Korea. Momoko notes that they’d be really tight on time on such a trip, but Airi thinks they’d be able to get through it. Momoko notes that even Okinawa would be tough, and the others agree. Airi points out that she’d love to go Hokkaido for a trip, and the others agree. Momoko mentions that they might go somewhere they can get to by driving or by train. Airi thinks that going by car would be really comfortable. Momoko relates to the others that she recently went to Gunma for work. She enjoyed herself there, where she went trout fishing. They caught, prepared, and dined on rainbow trout. The others comment that it sounds great, like they were going camping. Momoko also fully enjoyed herself with other outdoor activities and getting to eat lavender-flavoured ice cream. Airi: Eh~ What was that? How stylish! Airi suggests going to Hakone or Enoshima, even though they might be cliché. The other agree wholeheartedly that those places would nice too. Another place Airi would like to visit is the Kusatsu onsen, because there’s something that Airi describes as repetitive, going ‘janjanjan, dondonshan’. The two know what she’s talking about, something that creates a rhythm, but they couldn’t name it. My guess is that their talking about sozu, a hollowed out bamboo that collects water and makes a distinctive ‘clack’ after it empties. Momoko notes that hot springs have their own charm to them. She continues by mentioning that having a meal at a traditional Japanese inn is something she’d like to do. Airi agrees that it makes them really feel Japanese. Momoko concludes that this discussion really made her want to go somewhere, but it would be tough to actually pull it off. Thus, the discussion topic was a trying one, as it just built up the girls’ interest and tickled their fancies, but would most likely go unrealised. Airi mentions that she’d go to the convenience store to buy bathwater additives that would make her bath reminiscent of the hot springs. Miyabi: That’s precious, even if all you get is an inkling of the hot spring experience. Close your eyes and get in. Airi: Like you’re in a bath in Hakone. Momoko: Close your eyes and savour the scent. Miyabi: You’ll be like, ‘Ah, I’ve arrived in Hakone’. Momoko sums up by stating that she thinks that day trips would let the soul refresh itself, so she recommends going on one to those who have the time to try it out. The situation: This 17 year old girl is one of three female managers for her high school’s baseball club. Recent disputes among the managers have had her thinking about quitting, and the fights were over who would be responsible for washing the ace’s uniform. She really likes the ace, so she’d like to ask whether she should continue as a manager. Momoko: Well, that’s how youth is. Airi states that 17 is the age where one has the most fun, although she’s forgotten about that time, despite being the youngest. Momoko and Miyabi say that they remember a little bit, just a little. Airi reiterates that her memories have worn thin. Momoko sums up the situation. Airi’s amazed that they’d want to wash the uniform at all. Both her and Miyabi wouldn’t want to do it. They discuss scenarios of why anyone would want to do the washing. Airi would like to know more details, since both her and Miyabi don’t really understand the listener’s motivations. Airi: That sounds a little aged. Momoko conjectures that perhaps the listener enjoys the smell of Takeshi-kun’s sweat, that she wants to monopolise it. Miyabi squeals, grossed out. Airi points out that it would be an even bigger problem if that was the case. She suggests that maybe it might be the handing over of the clean clothes that might be the attraction, since it gives them increased opportunities to communicate. In situations like Valentine’s Day, she could hand over chocolates together with the clothes. Momoko and Miyabi agree that this would appeal to the hearts of boys. The girls joke about how they could take advantage of that situation. Airi: What if it was our managers, discussing who among them would be washing our clothes today? Momoko: Ewww, no way! Stop that! Momoko: No, you’ve got it completely wrong. Summing up, they all agree that it seems like fun, that it’s very representative of the days of youth. Momoko starts suggesting that perhaps they could divide the duty throughout the week. Airi agrees, saying that stopping from the washing duty could be considered a declaration of giving up, and the listener might regret it. Momoko closes up by recommending that the listener try to appeal to the ace in other ways besides doing the washing, in her own way. And it’ll be fun, because that’s how youth is. My japanese isnt that good but i thought the last bit was something likr airi: “what if we were to choose one of our managers to wash our clothes? ?” Momoko: No way! Miyabi: I dont even want to think about it and momo is like ill even take my clothes back home all the way to chiba to wash it lol. Not sure if its correct but that bit made me laugh the most. Good job on the translations however helps to see what i didnt get from listening. No worries, my Japanese isn’t that good either. That got me imagining… what if it were instead other Hello! members wanting to wash their clothes? I can totally imagine Fuku-chan immediately offering to do Momo’s. And I’d be getting the popcorn out to see KanaTomo and Daaishi fight it out for Airi’s.